Description of "The Final Appraisal and Other Stories"
The Final Appraisal and Other Stories takes the readers on a journey towards the dark, ominous, morbid realities of life, something from which there is hardly any escape. It tells the tales of six characters who make inexplicable choices, prompted by the unknown. What do their choices mean for themselves and the people around them? It's for the readers to find out. The Author currently resides in New Delhi. She is a Master's Degree holder from the University of Calcutta and is training for Language Teaching. She has worked as a teacher and copy writer for several months. She is currently working on a host of different writing projects along with her next book. 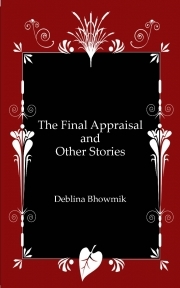 Reviews of "The Final Appraisal and Other Stories"